Home › Culture › Working for the good of those around us. Working for the good of those around us. James D. Hunter has outlined some very significant, worthwhile concepts in his book that are worth considering by all. The trouble that he sees in our current cultural context is that we have relegated everything to the political realm of discourse, and have seen that as the only venue through which to affect cultural change. Part of what Hunter then is arguing for is a presence in culture that takes on neither of the trappings of the religious right or the religious left, but instead argues for a mindset and practice that views the world through the lens of the scriptures, not just a political mindset. It is this theory of cultural transformation that he calls “faithful presence within”. 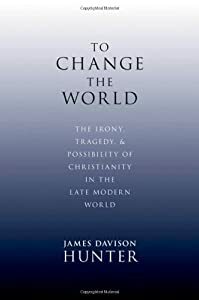 Many Christians would undoubtedly object to this broader understanding of faith, hope, and love and, even more, object to creating common space in which those outside of the Christian community can also appropriate meaning, purpose, beauty, and belonging. Why should their commitment to the world go beyond trying to persuade nonbelievers to convert in order to attain heaven? Beyond being a good in its own right, there are at least two reasons why Christians must move in this direction. The first is a political reason: Christians cannot demand for themselves what they would deny others. A right for one is a right for another and a responsibility for all. A right for a Christian is a right for a Jew is a right for a Humanist is a right for a Muslim is a right for a Buddhist, and so on. The second is a cultural reason: the very plausibility and persuasiveness of the Christian faith depend on a cultural context in which meaning, purpose, beauty, and belonging are possible. The viability of Christian faith and the possibility of sharing that faith depend on a social environment in which faith–any faith–is plausible. The command ‘To love thy neighbor’ contains no qualification as to race, religion, culture or location.